Virtus Investment Partners is a premier provider of investment solutions that offers a multi-manager, multi-strategy approach to institutions, financial advisors and individuals. Virtus has a dedicated team at ddm with years of experience working with asset managers. The print and digital teams don’t work in isolation, they work smart and leverage each other’s expertise to improve the presentation of information or reduce the time to produce marketing materials without sacrificing quality. The Virtus websites needed updating to support the doubling of products, significantly improve the user experience, be flexible to support a changing compliance environment and skillfully take data from multiple sources with multiple file types to feed the product content across the site. The investment products are more than data on a page though, communicating relationships throughout the site allows for an engaging experience that funnels website traffic to the product pages. These relationships are automatically updated when new data is uploaded so product changes are a breeze—no need to hunt through the site to update links and lists. In addition to a new main website that doubled their product offerings, Virtus was able to consolidate resources from three separately supported solutions to ddm’s content management system (CMS) to power every aspect of their websites, iPad app and iPhone app. ddm’s CMS caters to their specific business needs rather than fitting their business needs into separate tools and trying to pull them all together. As a multi-manager firm, it wasn’t just one website that needed to change, it was all the sites at the same time. 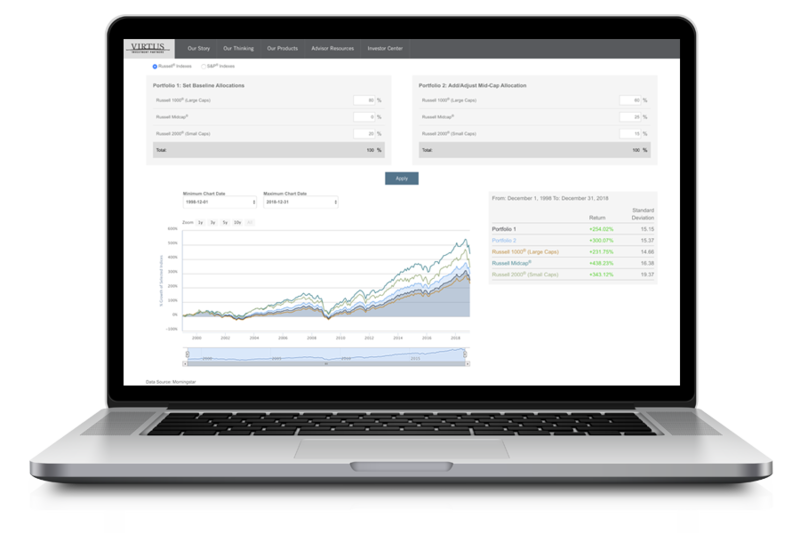 Our interactive tool on virtus.com compares the return and risk of a baseline portfolio of large- and small-cap stocks to one that includes mid-cap stocks, when invested over different, selectable time periods. When you add interactive technology to a website, a new platform is created for wholesaler and client engagement. The website is not isolated from other marketing resources. When the products doubled, so did the supporting materials. As a trusted partner, ddm can scale up or down to meet the demands, maintain consistency and improve operation efficiencies. The data automation not only supports the websites, but the print materials as well. ddm’s process for automating fact sheets and other sales and marketing materials allowed Virtus to support more targeted marketing efforts, such as more individual documents, with speed and accuracy. Any information posted represents ddm’s opinion and may not represent the views of Virtus. The Virtus Investment Partners logo is a trademark of Virtus Investment Partners.